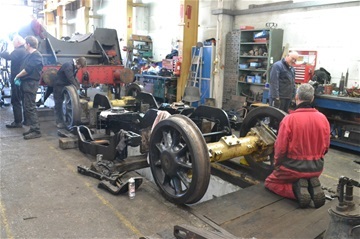 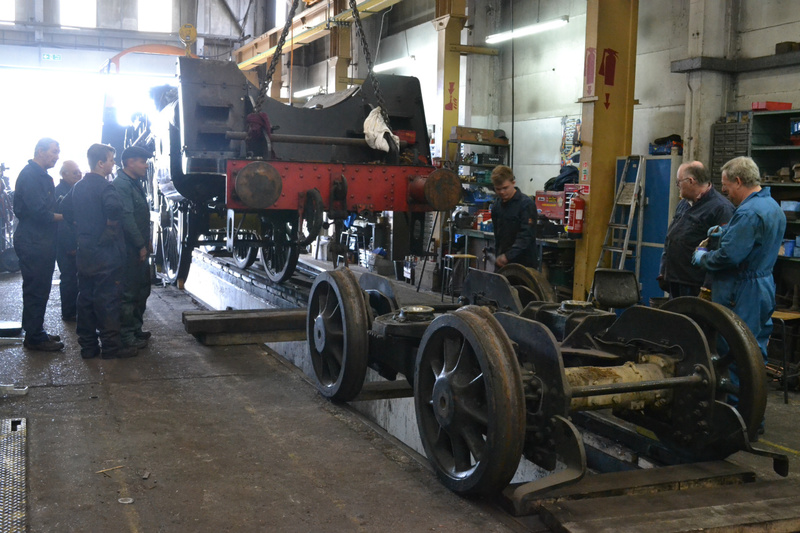 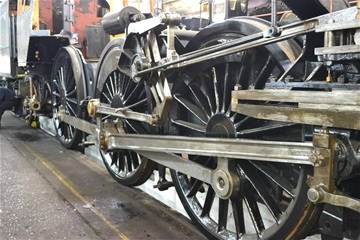 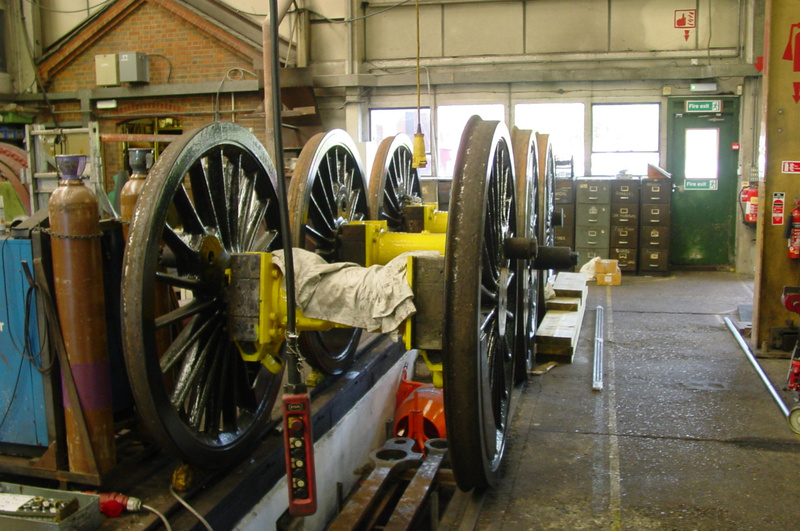 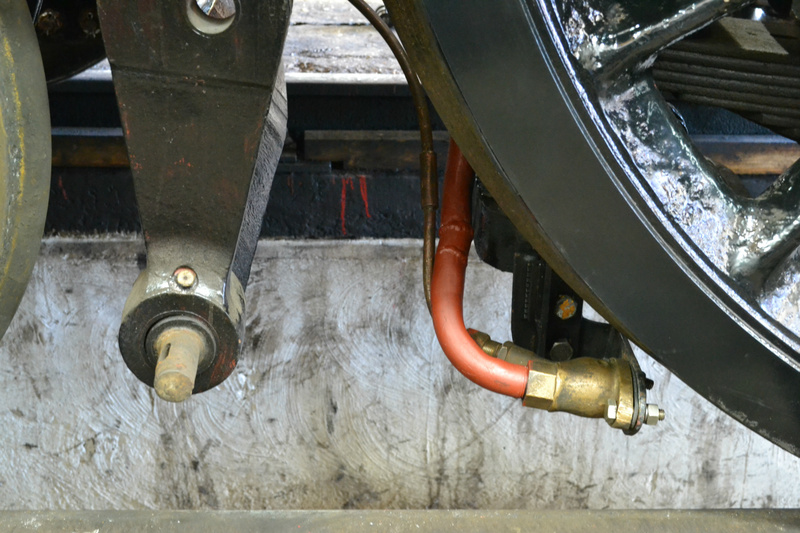 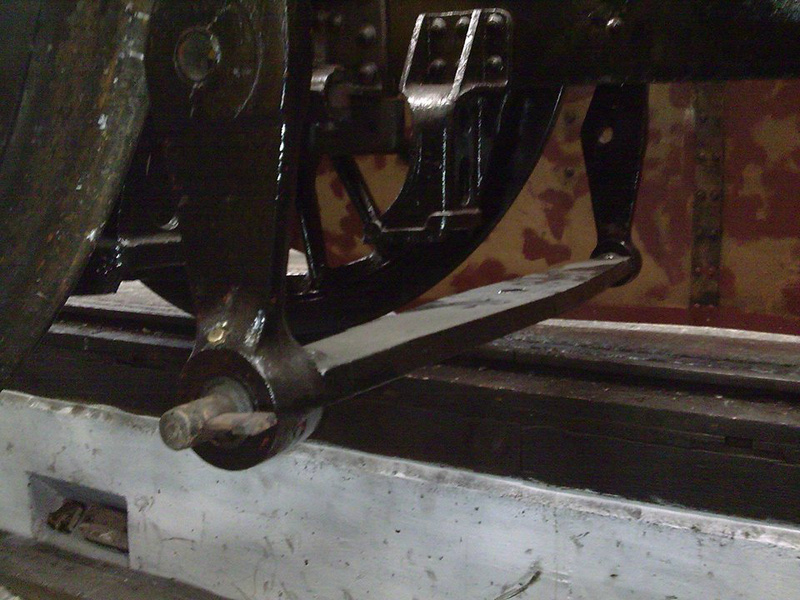 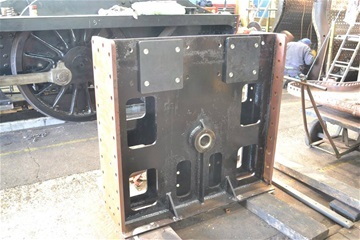 Frames and driving wheels reassembled, July 2014, P GIBBS. 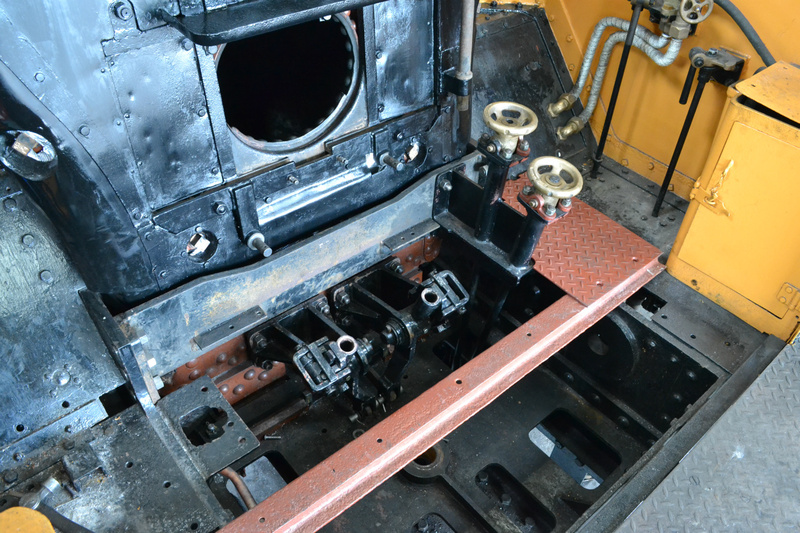 The Cab, July 2014, P GIBBS. Brake hanger assembly replaced; September 2014. 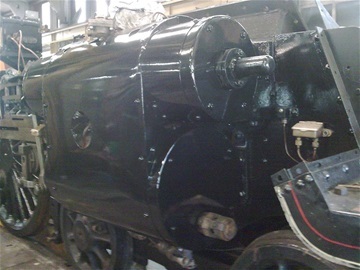 P GIBBS. Injector Controls and Sprinkler Valve placed in Cab, November 2014. P GIBBS. Motion reassembled; January, 2015. 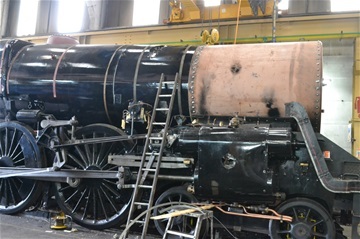 N WREN. 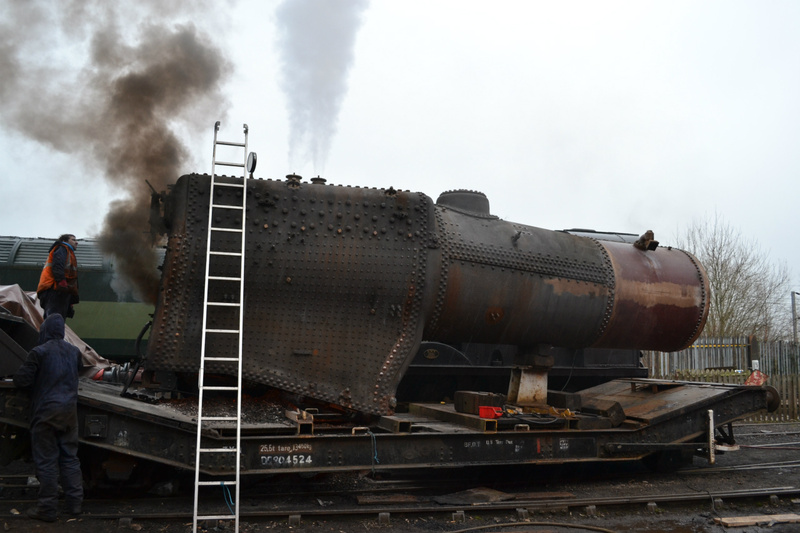 Successful steam test! 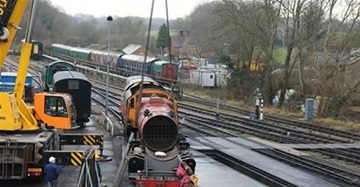 Camelot's safety valves lift, for the first time in ten years; January, 2015. 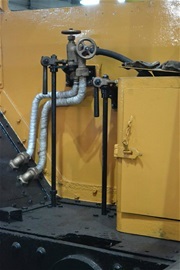 P GIBBS. 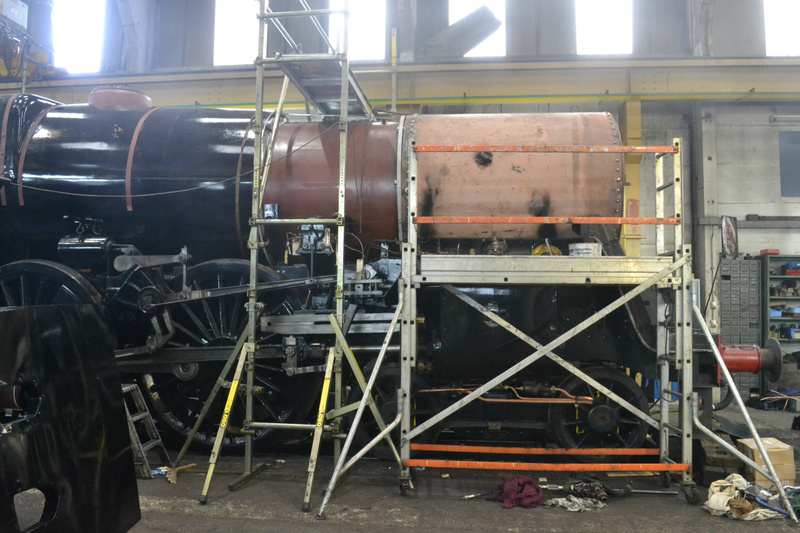 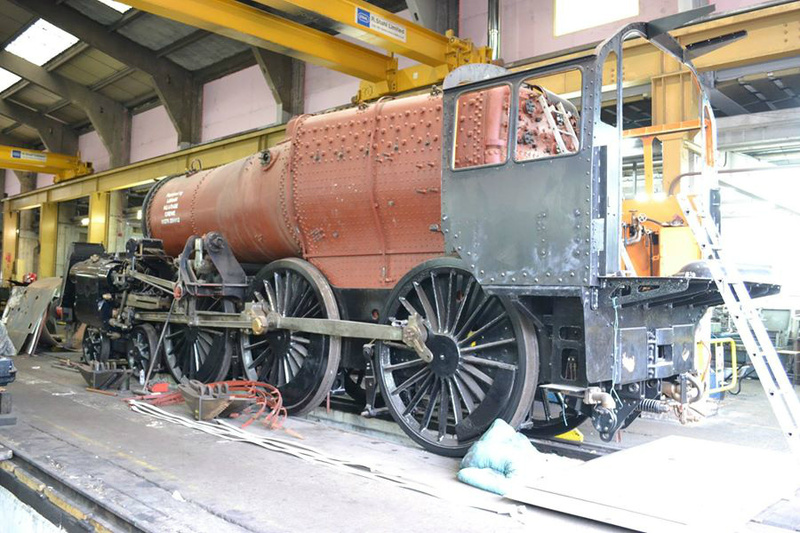 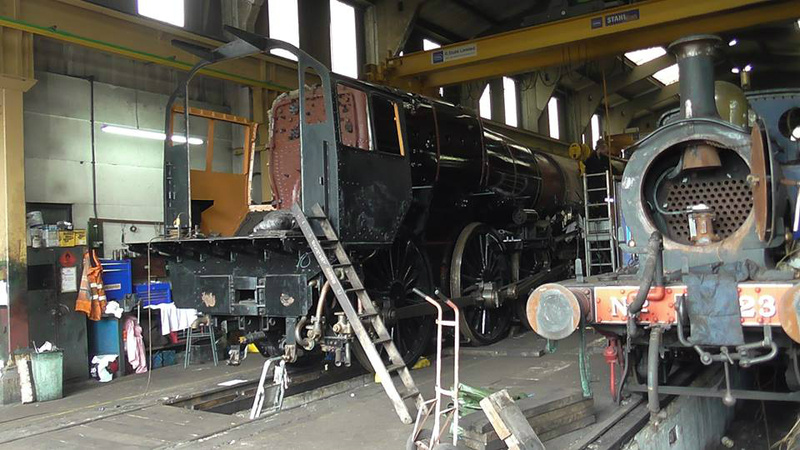 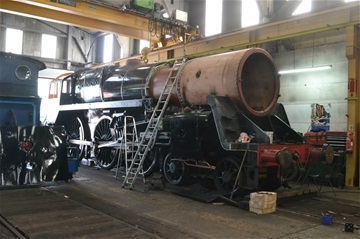 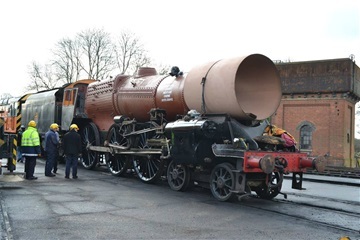 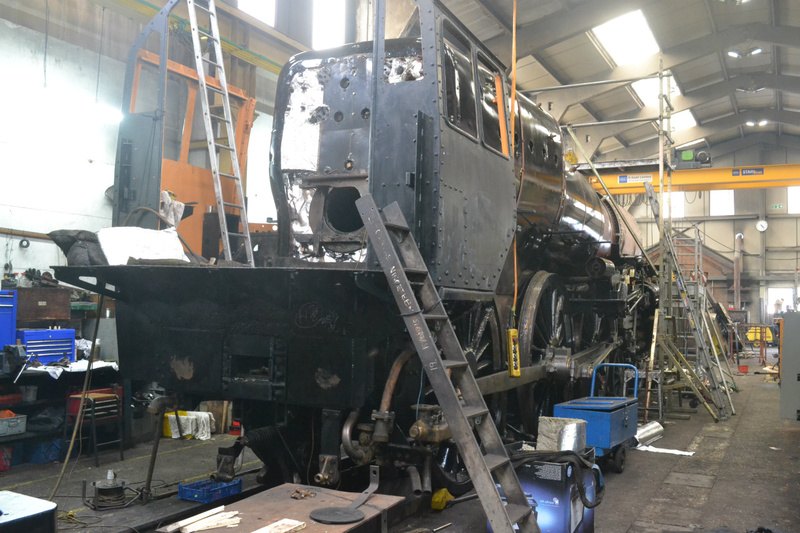 Back at Sheffield Park, the repaired boiler is craned back onto the frames; January, 2015. T SULLIVAN. 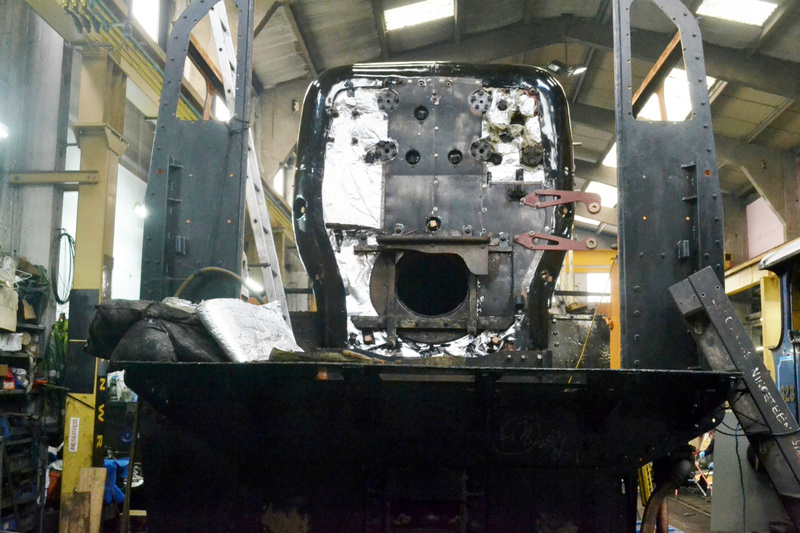 A locomotive once more, now we just have to replace the small bits; January, 2015. 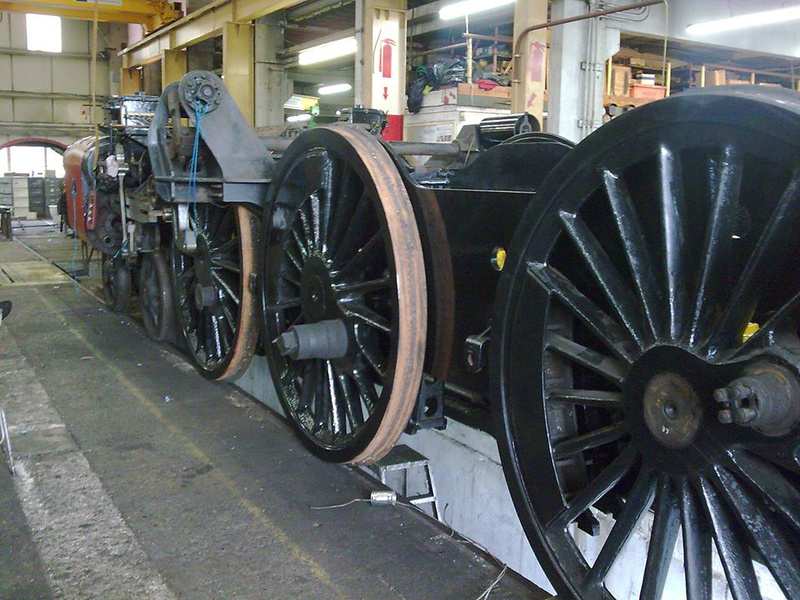 P GIBBS. 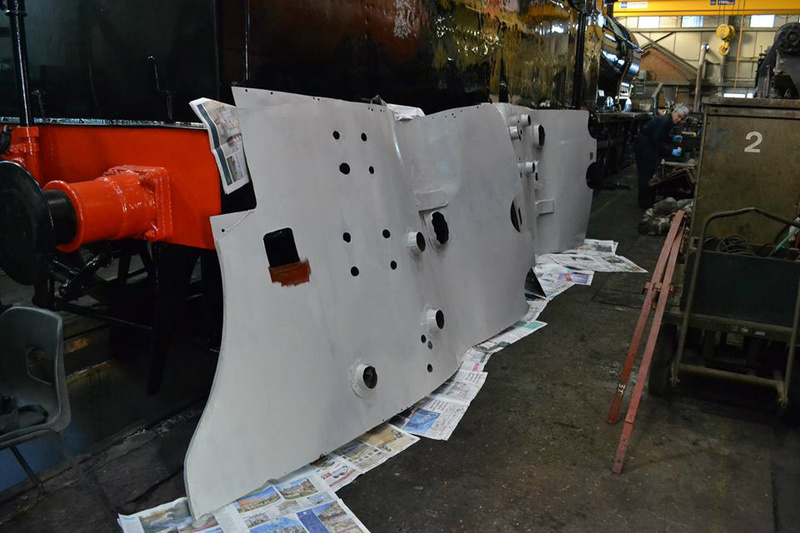 Painting the boiler cladding, February 2015, P GIBBS. 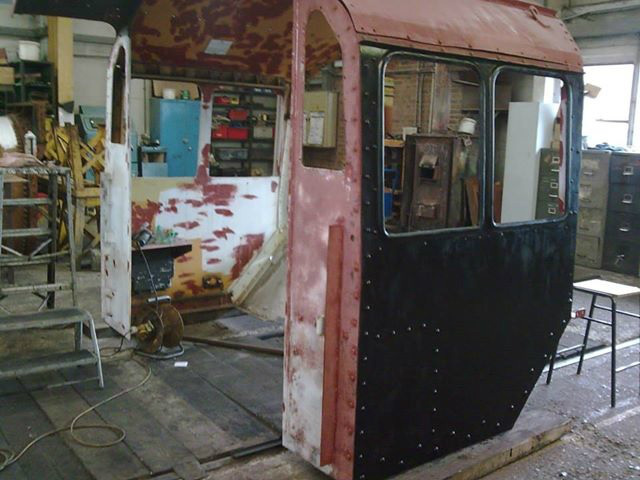 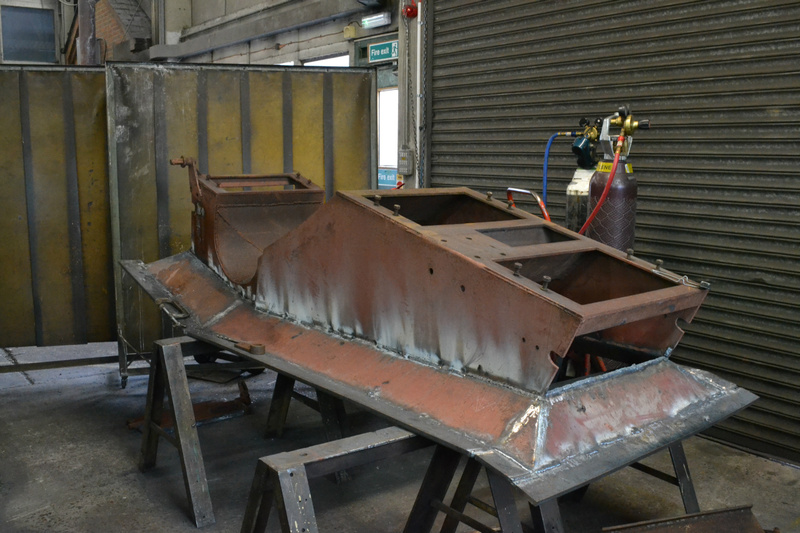 The new ashpan is progressing well, the damper and hopper doors are now being fitted, and it should soon be ready for fitting to the firebox. 5 April, 2015. 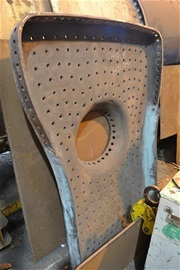 P GIBBS. 19 April, 2015. 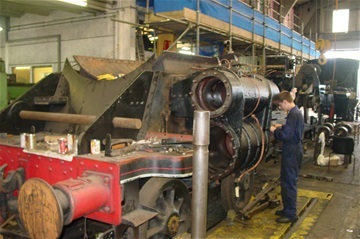 The bogie, under repair, is now dismantled. 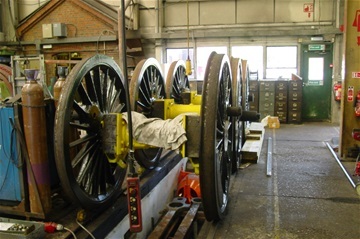 P GIBBS. 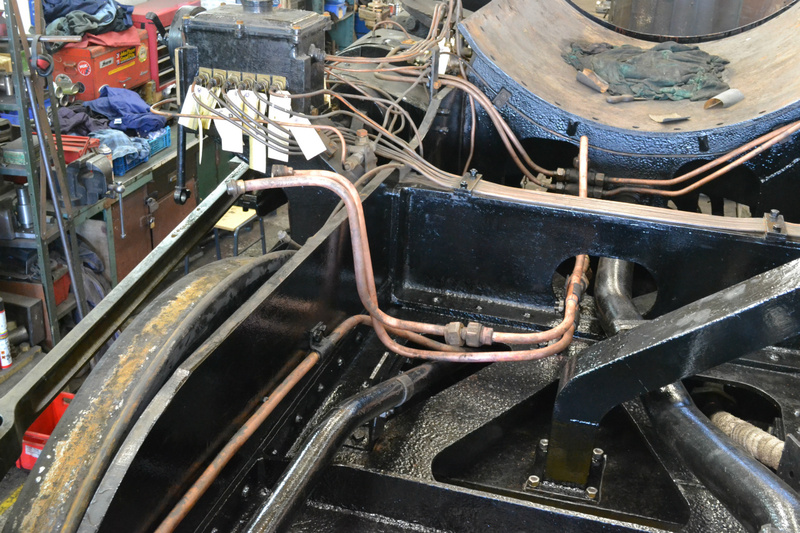 New pipework for the sanding gear, 10 May 2015, P GIBBS. 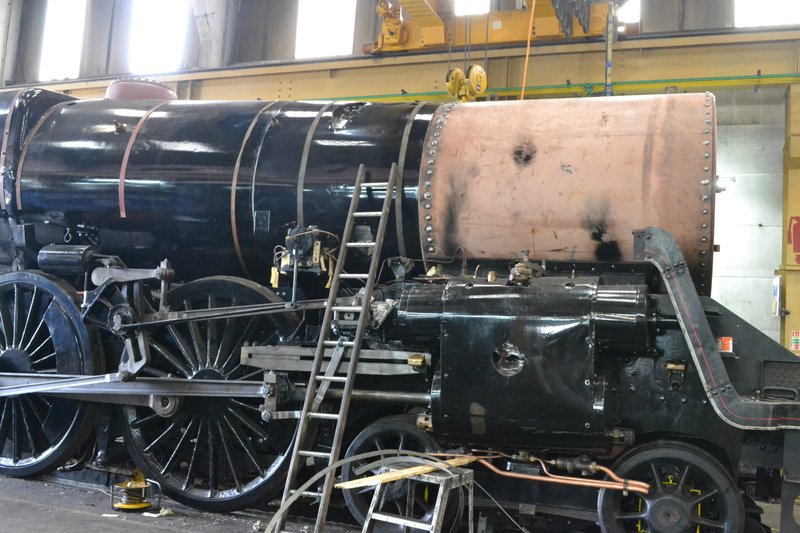 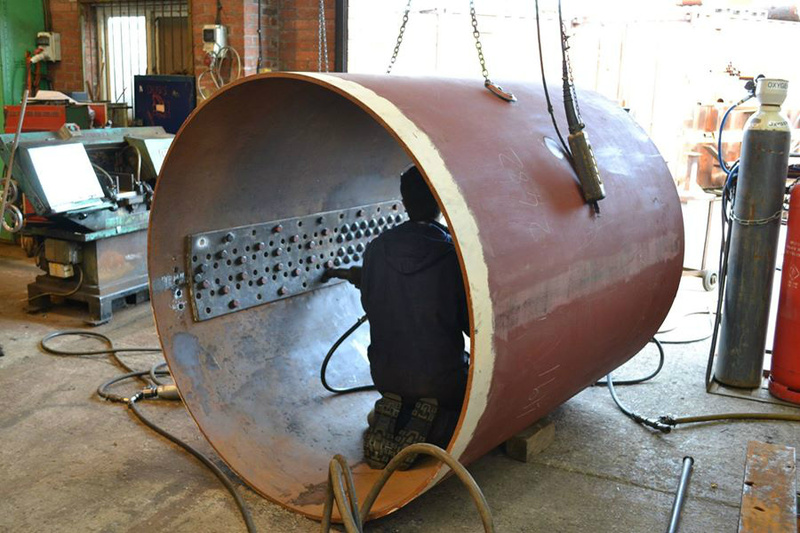 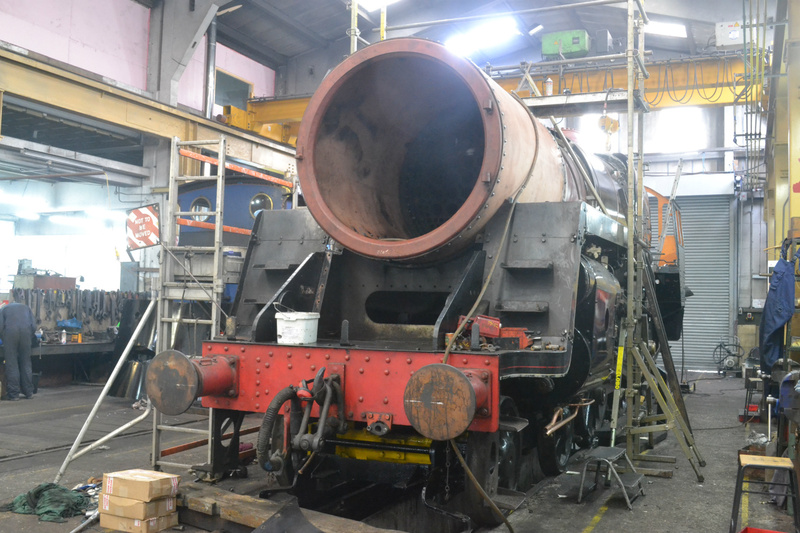 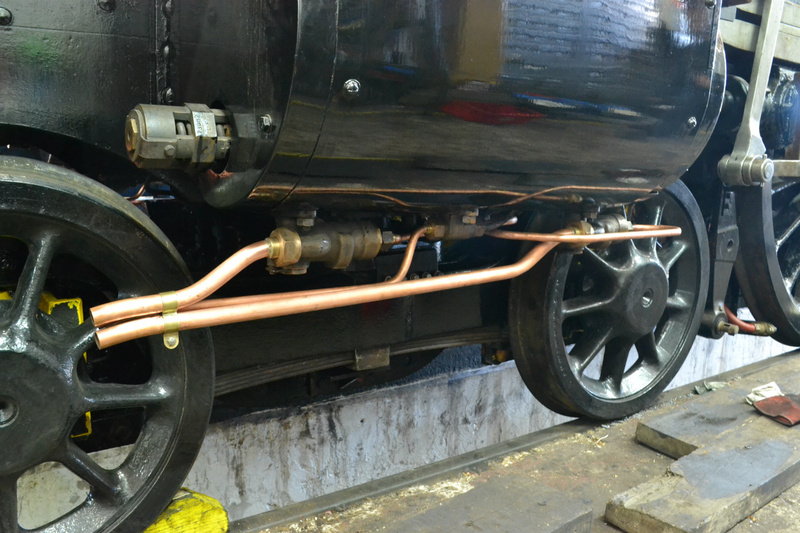 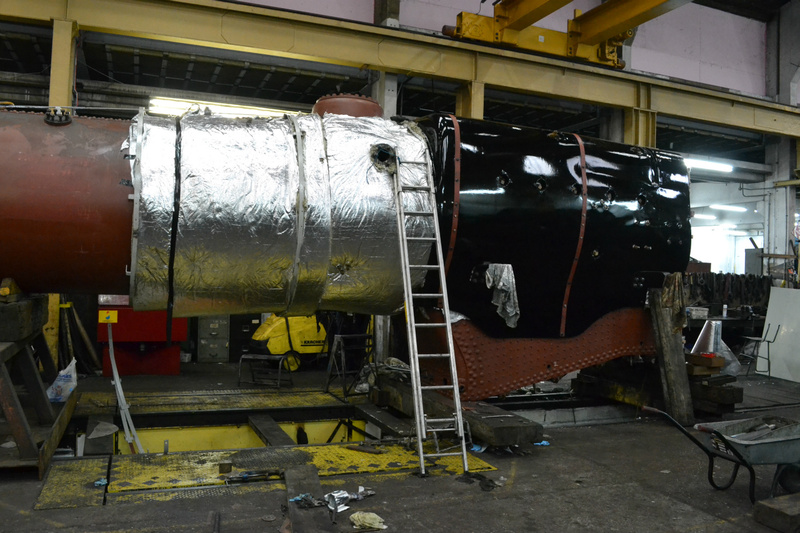 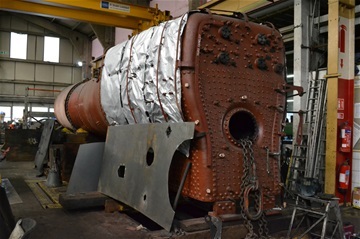 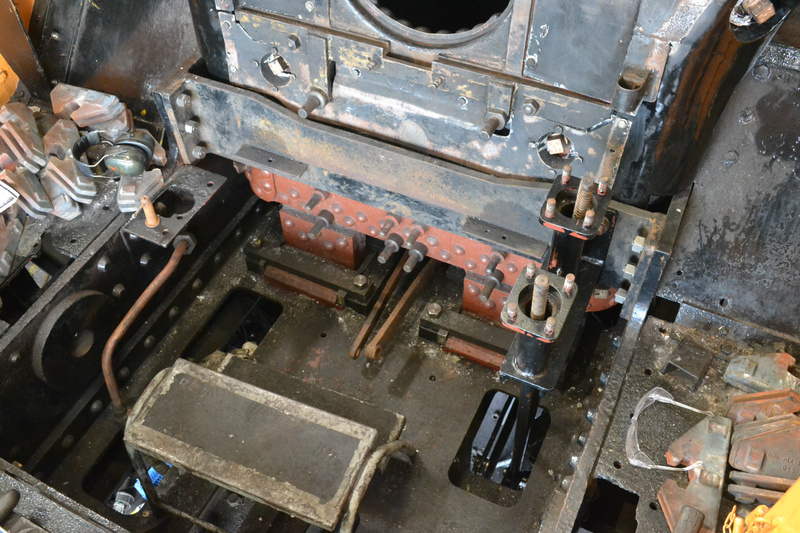 After a test fitting and adjustments, the ashpan is finally fitted to the boiler, 16 May 2015, P GIBBS. 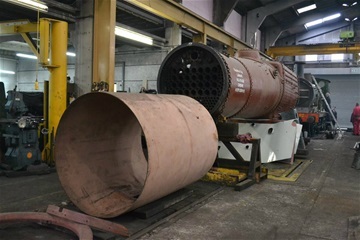 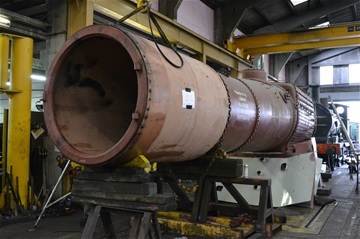 Steam pipework for the sanding gear, 16 May 2015, P GIBBS. 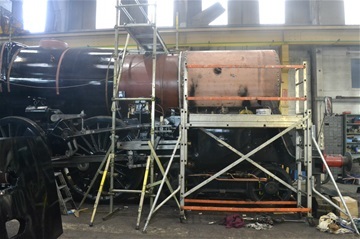 The boiler is now back in the frames. 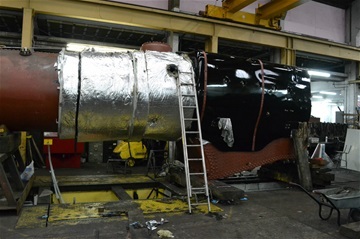 23 May 2015, B JENDEN. 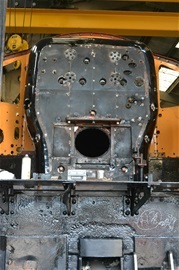 Rear view, showing cladding, firehole door and brackets fitted. 31 May, 2015. 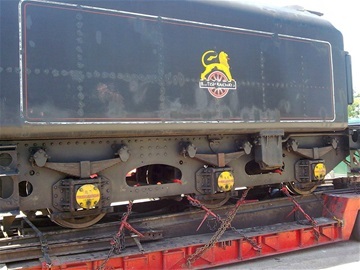 P GIBBS. 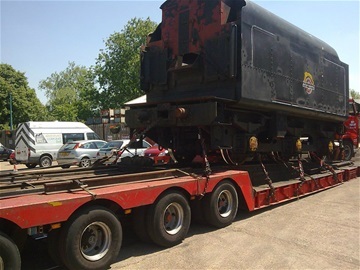 From the front, looking more like a complete locomotive; sloping panel below smokebox is out to provide access for fixing down. 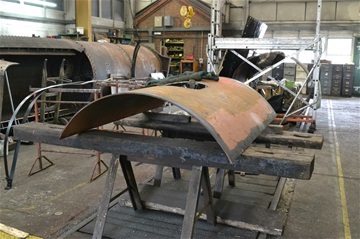 31 May 2015, P GIBBS. The tender returns from Ashford with gleaming reprofiled wheel tyres. 11 June 2015. N WREN. 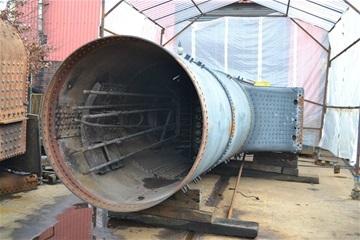 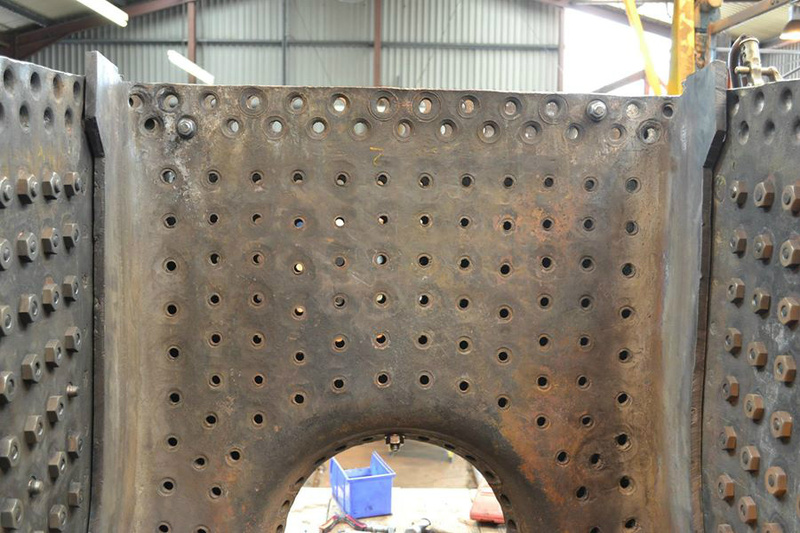 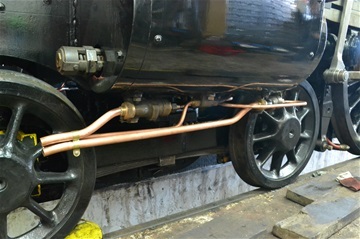 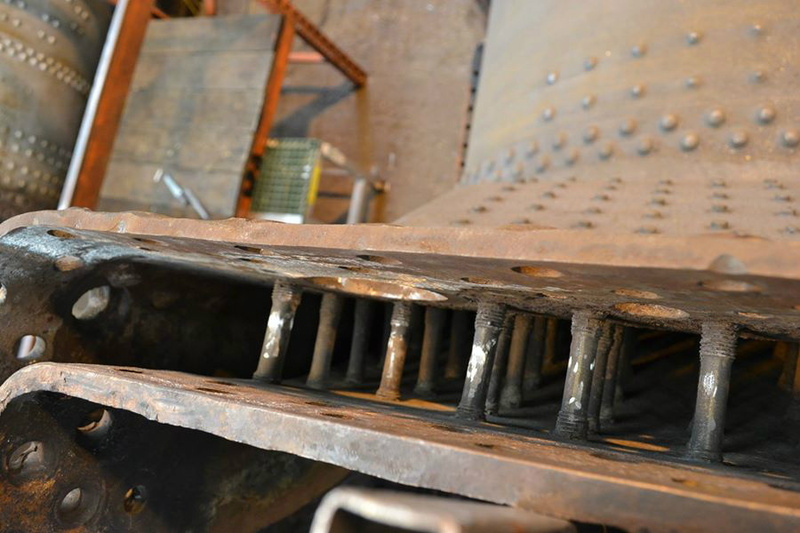 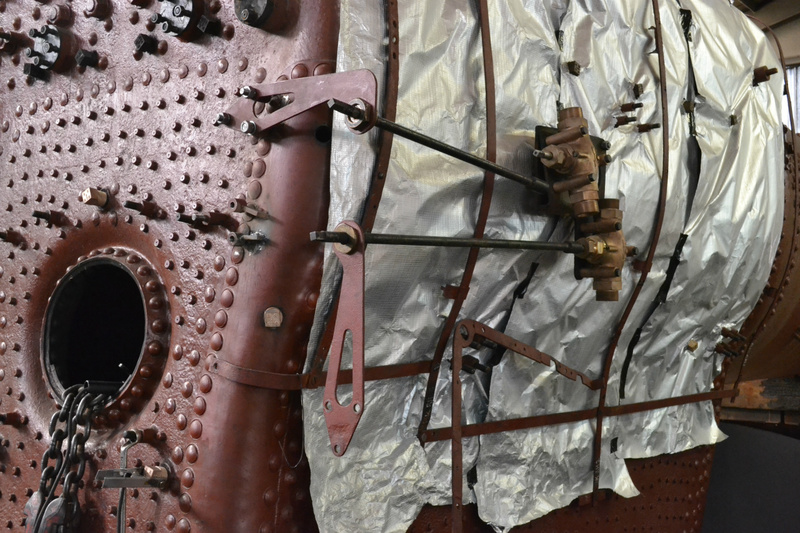 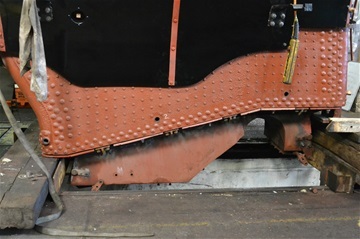 The last section of the boiler cladding is in place, following mounting of the handrail stanchions on the new front boiler barrel. 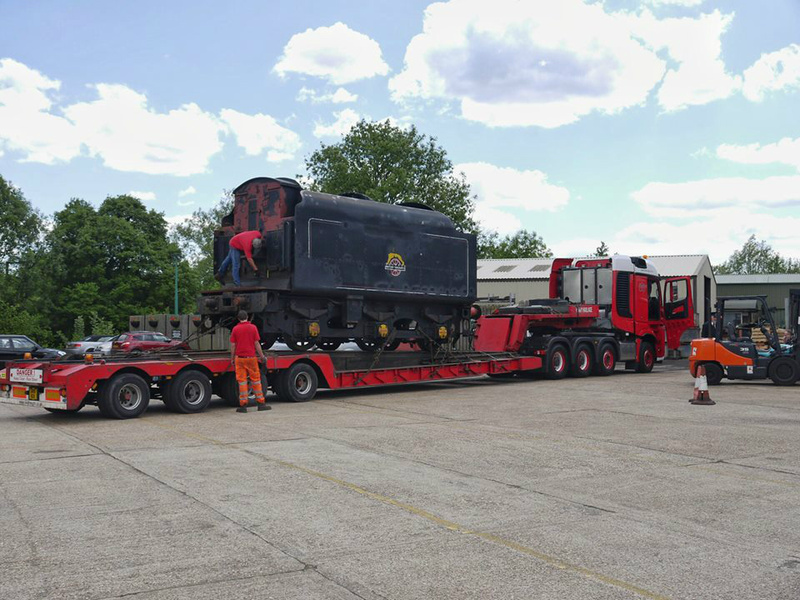 14 June, 2015, P GIBBS. 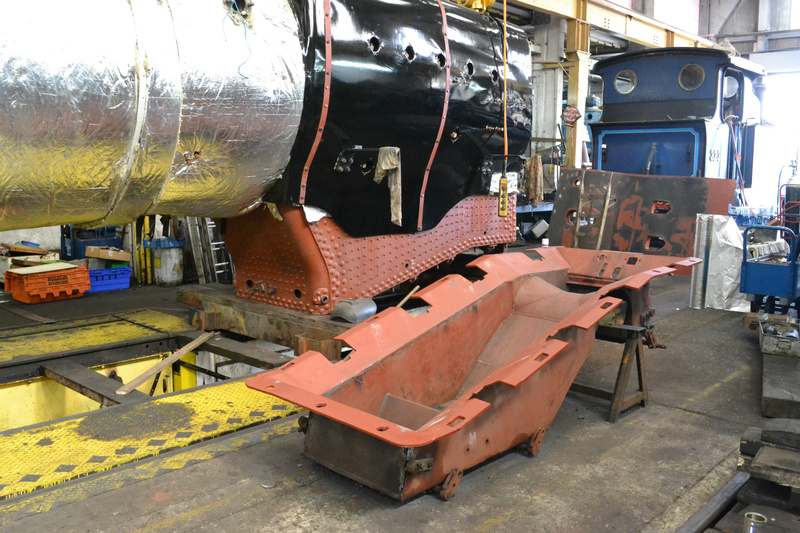 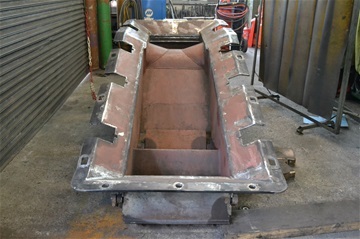 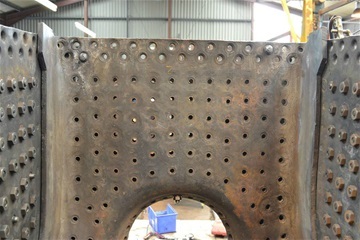 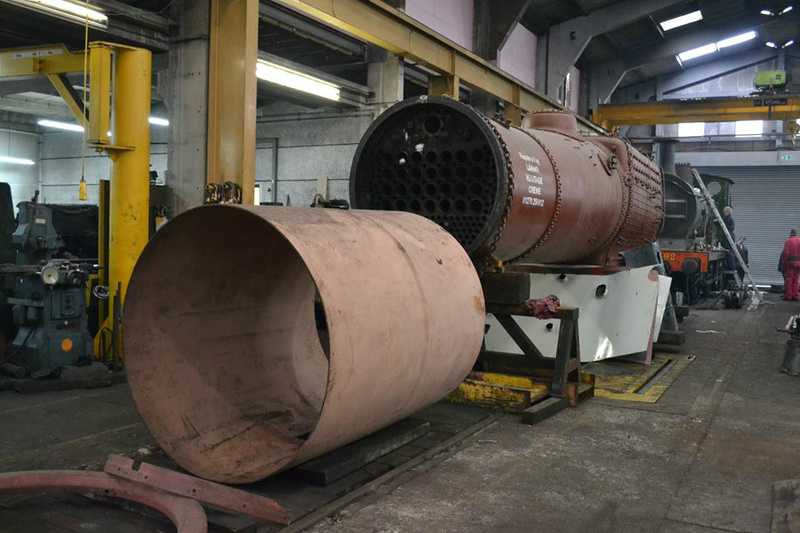 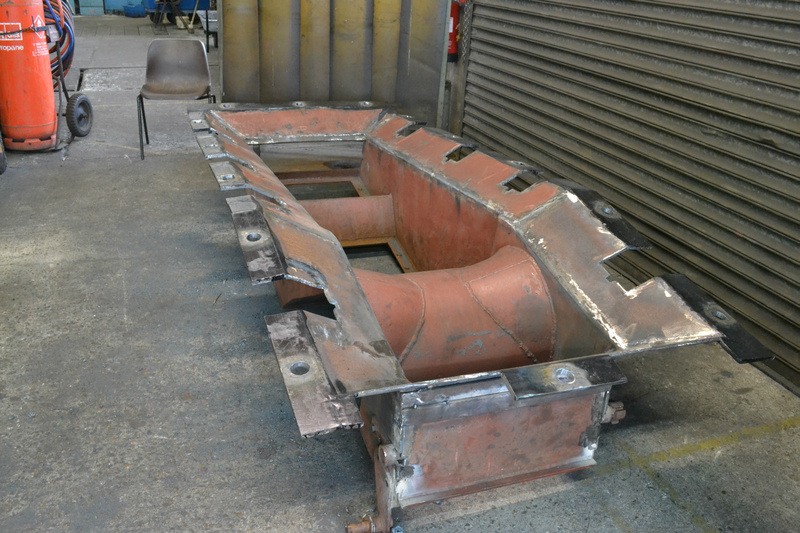 The new smokebox liner (shown inverted) is being prepared for fitting. 14 June, 2015. P GIBBS.